In nine months time, Kampala will be a different city - smarter, cleaner and safer, President Yoweri Museveni has assured the nation. Museveni said as government moves to implement the elements of a smart and safe city solution, Kampala will be transformed into a modern city; where there's more reliance on technology than human capacity to fight criminality. This was part of Museveni's national address on the state of security from State House Entebbe on Saturday evening. A safe and smart city solution enables the inter-linking of public and private networks for more efficient and effective security management. In other words, with the inter-connection between devices and networks, government gets access to new tools so as to have a wider outlook of the security of an area at any given time. Museveni said machines are cheaper than human beings, adding that government will rely on human beings for a short time then scale down the number human beings manning security. He said when one visits modern cities like London, there is more use of technology compared to reliance on human capacity. Museveni said he's annoyed and pained by the killing of innocent Ugandans, adding that having fought criminality with limited means in the past to defeat LRA and ADF rebels, with advanced technology, this will be history. Museveni's statement comes at the climax of insecurity in the country characterised by assassinations of high profile and low profile citizens. Barely two weeks ago, former Buyende district police commander Muhammad Kirumira was gunned down together with his friend, Resty Nalinya in Bulenga, in Wakiso district. There have been several assignations in the country, for instance, the brutal assassination of Ibrahim Abiriga, the Arua municipality MP and his brother Saidi Kongo, former police spokesperson Andrew Felix Kawesi, state prosecutor Joan Kagezi, and sheikhs in the country. The president also reiterated the need to expedite his 10-point security program of installation of cameras, finger printing of guns, use of drones, banning of hoodies for motorbike riders, installing tracking devices on motor vehicles and motorbikes among others. The European parliamentary debate on the chaos that ensued in Arua and the subsequent arrest and alleged torture of suspects, was based on rumors picked from social media, Uganda government spokesperson, Ofwono Opondo has said. The European Union parliament on Friday last week challenged President Yoweri Museveni and his government to respect the independence of the country's parliament as an institution and the independence of the mandate of its members and ensure that all members of parliament freely pursue their elected mandate. During the debate, the European parliament high representative of the Union for Foreign Affairs and Security Policy, Federica Mogherini said allegations of torture of 33 suspects, referred to as #Arua33 on social media including four members of parliament are serious and perpetrator must be prosecuted. Mogherini told the European parliament that security forces have a duty to respect human rights and that Ugandans deserve peace and a right to peacefully express their political opinions. "Let me state once again very clearly that security forces have a duty to respect everyone's freedom to peacefully demonstrate for their opinion. The allegations of torture are serious, and, if confirmed, the perpetrators must be prosecuted and the victims must obtain redress." Mogherini said. "Uganda, unfortunately has a long history of violence and conflict, and we know very well that its people deserve some peace and the right to demonstrate their opinion. We've made this very clear to the Ugandan government and will continue to engage so that the responsibilities are established and perpetuators are brought to justice"
She added that the European Union representatives in Uganda visited Kyadondo East legislator Robert Ssentamu Kyagulanyi also known as Bobi Wine during incarceration at Makindye Military barracks and Mityana municipality MP Francis Zaake who was then admitted at Rubaga hospital. She said the EU representatives found that the two legislators had several wounds and needed comprehensive medical treatment. Today, Opondo told journalists that at long last, the European Union has finally removed all pretense and is now showing which side they support when it comes to Uganda's politics. "Uganda would like to assume that the EU parliamentarians either acted out of their natural limited knowledge of our country, or picked rumors and unverified information on social media, and, therefore have chosen to remove any veil of pretense about where they stand when it comes to judging various players in the Uganda political scene...They formally and unashamedly warned the Ugandan people and their government; that budget support funds given to the country for development should be used as leverage to monitor whether opposition MPs are being hindered." In the same 14-point resolution, the EU parliament asked the Ugandan government to "drop what appear to be trumped-up charges against Bobi Wine and to stop the crackdown against opposition politicians and supporters," as well as launching an "effective, impartial and independent investigation into the killing of Yasin Kawuma (Bobi Wine's driver) and the reports of deaths and excessive use of force during the protests." But Opondo said Uganda hasn't formally received the European parliament resolution. The motion, and subsequent resolution, Opondo argued were "unfair, unsubstantiated and not objective." He said the European parliament fell below the bar when they failed on the diplomatic front after they failed to formally ask for a response from Uganda before the debate. "Contrary to well known established diplomatic procedures, the EU parliament in Brussels entertained, discussed a motion and passed a resolution which in our view we deem unfair, unsubstantiated, not objective. To this day as we speak, it has not formally furnished the government of Uganda either through our embassy in Brussels or the ministry of Foreign Affairs who raised those complaints against Uganda and why was it rushed without seeking formal Uganda government response." Opondo further said the government is dismayed by the MPs' call to drop the charges against those who were arrested in Arua instead of calling for an impartial and speedy hearing. "It is inconceivable that a parliament in Europe would pass a resolution asking our courts to drop charges instead of calling on the courts of Uganda to be as transparent as possible to do correct investigation and let the course of justice take its course. We see this as premeditated attempt to hijack and subvert our institutions. Could the EU parliament and those who actively promote impunity in other people's nations have some humility in this area especially given the fact that the matters they are discussing are under investigating and some of them are actually before court." Opondo added. The resolution, Opondo said government believes was debated and passed at the instigation of local and international NGOs as well as some lawyers recently hired in London and Washington. The lawyer that Opondo was referring to is; Robert Amsterdam who ushered Bobi Wine unto the international scene and media. Amsterdam has been calling for sanctions against Uganda's top leaders over torture and abuse of human rights. Opondo argued that the nature of the debate and final resolution showed glaring signs of active coaching and prepared short notes for the MPs to read. "The mere fact that we have an extremely vocal minority that can reach EU parliament, doesn’t mean that the silent majority in their shambas, market stalls, dukas [shops], workshops, schools, and health centres shouldn’t be protected against hooliganism," he said. President Yoweri Museveni who settled for September 15 as his probable date of birth turns 74 today. But there is no birthday celebration on Museveni's official schedule, according to the senior presidential press secretary Don Wanyama. "The official programme is a couple of meetings and a press conference in the evening," Wanyama said when asked how the president will mark his 74th birthday. 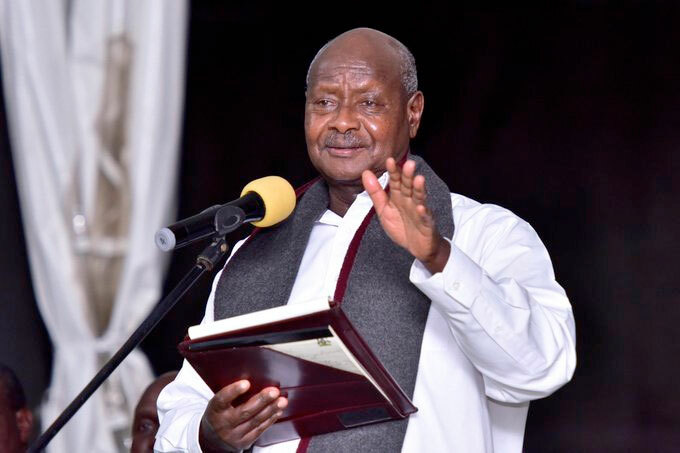 Museveni settled for September 15 as his birthday, after speculation and second-person accounts supported by what he calls a number of "historical and scientific" events that took place in 1944, the year when he says he was born. Writing in the 2nd edition of Sowing the Mustard Seed, in 2016, Museveni says three people including his mother, Esteeri Kokundeka helped him find out details of his date of birth. Museveni says his mother said he was born "like three months before the ekikatu (the mass cattle vaccination) of ishara-matu (when the cattle's ears were being notched)." Museveni says a veterinary guard who took part in the exercise, helped him get the year. "Fortunately, one of the veterinary guards that took part in that vaccination, Serugyendo (a Mufumbira from Kisoro) was still alive. He was a godsend. When I invited him to Rwakitura [Museveni's country home], he was unequivocal. The vaccination in Ntungamo took place between the 24 and 28 of November 1944." Since his mother had said it was like three months after before mass vaccination, Museveni said he first took August 1944 as the date of birth. But Museveni says there was another old woman who kept saying that she knew when he was born. When invited to Rwakitura, the old lady, Tophus Bwankuuku told Museveni another account. "She told me that she and her husband lived in the parish (omuruka) next to ours; that would be a distance of eight miles away. However, her sister in law (omuramukazi) was married in the village next to ours, Ruyonjwa (two miles away or less). She had undertaken okwangama (when a woman temporarily withdraws from her husband home on account of some disagreements and goes back to her father's or brother's household)," Museveni says. "When she arrived at their home in Rwenchweera, she told them that by the time she left, Kaguta's wife had been taken to the hospital to deliver. Then after a few days, information came that Kaguta's (Museveni's father) wife had delivered and the month was September not August," Museveni further recollects. Museveni then concluded that September 15, is the most probable date of birth. Museveni was reportedly born in Mbarara hospital but he says they had no records when he crosschecked. "What a shame for somebody who was born in a government hospital to fail to know his date of birth, all on the account of faulty record keeping and storage." Museveni never laboured to write about his date of birth in the first edition of Sowing the Mustard Seed which was first published in 1997. In the recent years, Museveni has been having low profile events to mark his birthday either in church or with the family. In 2015, Museveni celebrated his birthday by attending morning prayers at Mount Zion Prayer Centre, Bukalango and in 2016 he shared a cake with his family. Last year in August, Museveni celebrated his 70th baptism day at St Luke Church of Uganda, Kinoni archdeaconry in Rwampara, Mbarara district. According to church records disclosed during the celebration, Museveni was baptized on August 3, 1947, with his mother and father. Opposition politicians have for a long time contested Museveni's probable date of Museveni, arguing that he under-reported his age. In 2011 for instance, Democratic Party youth wing - Uganda Young Democrats wanted to organize a birth party for Museveni claiming that he was born on December 4, 1937. ENTEBBE. President Yoweri Museveni has said that Kampala will be a safe city within nine months as government moves to implement the elements of a smart and safe city solution for Uganda. This was part of President Museveni's national address on the state of security from state house Entebbe Saturday evening. He said that Kampala will be a different city, will be safe, cleaner and smarter. The safe and smart city solution is a single unified network security platform with complete visibility, where all stakeholders, across function, department or location, work from a common operation picture for improved response, with advanced situational awareness and improved incidence management. President Museveni says machines are cheaper than human beings and adds that the Government will rely on human beings for a short time then scale down the number human beings manning security. He says when one visits cities like London, there is more use of technology compared to reliance on human security. He said he is annoyed by the killing of innocent Ugandans, adding that having fought criminality with limited means, with advanced technology, this will be history. Museveni's statement comes at the climax of insecurity in the country characterized by assassinations. Barely two weeks ago Former Buyende District Police Commander Muhammad Kirumira was gunned down alongside a woman Resty Nalinya from his home area in Bulenga, in Wakiso district. There has been several other similar killings in the country including the brutal assassination of Ibrahim Abiriga, the Arua Municipality MP and his brother Saidi Kongo, former Police Spokesperson Andrew Felix Kawesi, Prosecutor Joan Kagezi, and different Sheikhs in the country. The President also reiterated the need to expedite his 10 point security program of installation of cameras, finger printing of guns, use of drones, ensuring no hoodies for motorbike riders, installing tracking devices on motor vehicles and motorbikes among others. PAKWACH: one person has been confirmed dead, while several others are still missing after a vehicle they were travelling in plunged into River Nile. According to Police reports, the incident involving a yellow Canter truck registration number UBA 094Z happened at 5am Sunday morning, about 300 meters away from Gaaga bus stage in Pakwach Town council. The Aswa River Region Police Spokesperson Jimmy Patrick Okema confirmed the incident in a press statement on Sunday. He noted that the vehicle had more than 20 passengers from Pabbo Sub-county in Amuru district who were travelling to Panyimur Market, one of the largest fish markets in the region. Mr Okema said the incident happened after the driver lost control of the truck when they were taking scrap metals to be sold at Lubiri landing site before proceeding to Panyimur Market. He noted that police with the help of locals have recovered a body of one of the traders whose identity was still unclear. “The braking system failed and the vehicle continued up to the water. Police together with concerned citizens have already rescued 12 people whom they have rushed to Pakwach hospital for treatment,” Mr Okema said. “Efforts for continued search are still on going. We call for calmness from the public, we shall do everything possible to recover all bodies from the water dead or alive,” he added. He however said the driver of the truck identified only as Johnson, 27 years, a resident of Nwoya district who survived the incident is on the run. The Pakwach District Chairperson Mr Robert Osteen Omito when contacted described the incident as unfortunate and a big blow to the business communities in the two regions. 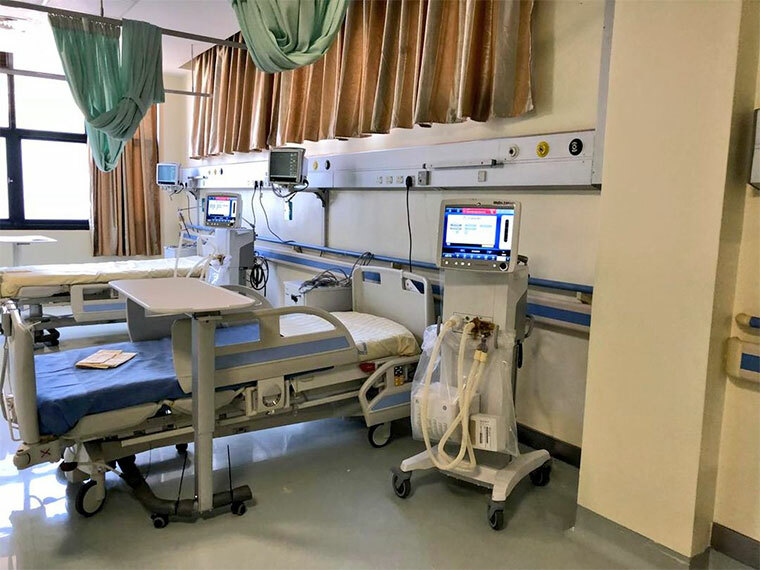 He noted that efforts to rescue or retrieve bodies of those who have died in water are being hampered by the absence of police marine divers in the district. “We appeal to the police marine department to intervene and help in the search for the bodies of those missing,” Mr Omito said. "We used to be scared," said Josephine Katumba, a 30-year-old hairdresser in Kamwokya, a poor suburb of Uganda's capital Kampala. "We don't have fear anymore." President Museveni has long had police beat the defiance out of his opponents, but a 36-year-old slumboy singer turned MP has energised and emboldened Uganda's youth, worrying the government. Black scorch marks on the potholed road outside Katumba's tiny salon mark where residents have routinely burnt tyres to protest the arrest of Bobi Wine, a local boy done good, charismatic pop star and unlikely opposition firebrand. There is "Free Bobi Wine" graffiti everywhere. "People have wanted change for a long time," said Katumba, nimbly braiding a customer's hair. "The difference now is that Bobi is young and he speaks for the youth." As a pop star Bobi Wine blended lyrics on social justice and poverty with catchy Afrobeat rhythms, earning him committed fans among Uganda's often poor urban youth. He took on the nickname of "His Excellency the Ghetto President". Under his real name Robert Kyagulanyi he won a by-election in 2017 and entered Parliament, where his popularity and outspoken opposition to Uganda's long-time leader shook up the country's "Groundhog Day" politics. In power since 1986, the 74-year-old Museveni is the only president most Ugandans have known: the country's median age is less than 16. Museveni has had the constitution amended twice, to remove term and then age limits, clearing him to run for a sixth term in 2021. The opposition has for two decades been similarly dominated by 62-year-old Kizza Besigye, Museveni's former friend and personal physician, who has lost four successive elections. Besigye "has become part of an entrenched political system in which change feels impossible without fresh leadership," said Kampala-based independent analyst Anna Reuss. Kyagulanyi has swiped the opposition mantel from Besigye and provided a voice for a youthful population fed up with old men telling them what to do. "Besigye is there to help, but he's not from the ghetto. 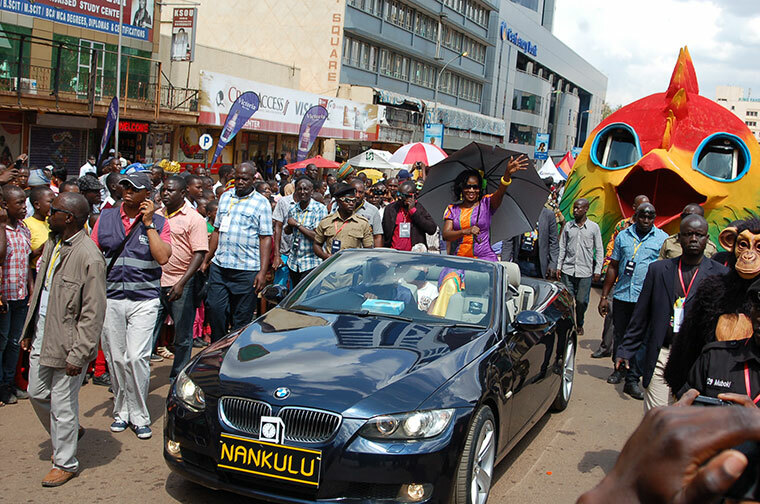 Bobi can come and talk to us on the streets," said Katumba. The combination of "his age, his background and his story" make Kyagulanyi a challenge unlike any Museveni has faced during his 32-year rule, said Ugandan writer and political analyst Rosebell Kagumire. She described him as "an outsider who is trying to shake things up". But in Uganda, shaking things up is risky. Kyagulanyi rode into Parliament on a wave of urban, youthful support. He quickly spearheaded resistance to the ruling party initiative removing age limits that cleared the way for Museveni to rule for life, and led protests earlier this year against a new social media tax. The image of Kyagulanyi, in his signature red beret, leading a crowd of supporters through the streets became ubiquitous. And as candidates he backed won a string of by-elections, Kyagulanyi was even harder to ignore. He and Museveni went head-to-head in August. Both men travelled to the northwestern town of Arua to canvass for rival candidates on the eve of a by-election and a proxy confrontation ensued. An opposition crowd allegedly stoned Museveni's motorcade, breaking a car window. Police responded with bullets and Kyagulanyi's driver was shot dead. The MP himself was arrested -- he claims he was tortured and badly beaten while in custody -- and charged with treason, as were dozens of others. Kyagulanyi's candidate, Kassiano Wadri, won the election. The torture allegations resonated, riling up Kyagulanyi's supporters. "We were angry and wanted to see that Bobi was fine," Katumba said, recalling the eruption of street protests that followed. Granted bail, Kyagulanyi has travelled to the US to seek medical treatment and has ramped up his criticism of Museveni's regime from afar. For his part, the president seems unable to adapt to the shifting challenge. The arbitrary arrest and beating of opposition leaders is an old tactic that was deployed against Besigye for years, but young Ugandans are less cowed by such brutal displays of state strength. Even Museveni's trademark rhetoric, a form of didactic bonhomie mixed with folksy metaphor, is increasingly tone-deaf: in a recent speech on the state of the nation he patronised much of his audience by addressing them as "bazukulu", meaning grandchildren. Kyagulanyi's expected return to Uganda will test Museveni further. Reuss said that while he is "unlikely to unseat Museveni", the continual use of force "further delegitimises Museveni and opposition grows further". Back in Kamwokya, the slum Kyagulanyi still calls home, one of Katumba's employees looks south for a solution to his country's tenacious old leader: "We want Museveni to be like Robert Mugabe: accept and go," he said. South Sudan's President Salva Kiir and rebel leader Riek Machar signed a much-anticipated peace deal on Wednesday, the latest attempt to end five years of a vicious civil war that's torn the world's youngest nation apart. Seated before a roomful of regional leaders, diplomats and officials convened in the Ethiopian capital, the two men signed a document meant to end a conflict that began in 2013 and quickly spiralled into a regional crisis. Hopes were high that the agreement, the details of which were not announced, will end the war which has cost the lives of tens of thousands of people, pushed millions to the brink of starvation and scattered refugees across East Africa. "The eyes of the world are upon us as the South Sudan leaders commit today to press for reconciliation and lasting peace in their country," said Ethiopian Prime Minister Abiy Ahmed at the start of a brief but delayed closed-door meeting after which Kiir and Machar emerged to sign the document. The agreement was greeted with applause and ululations from the delegates, but also concerns from some parties that it might not be honoured. Since the civil war began in December 2013 -- following Kiir's claim that Machar was plotting a coup -- the Intergovernmental Authority on Development (IGAD) regional bloc, chaired by Ethiopia, has taken the lead on peace negotiations, to little effect. The last peace pact collapsed in July 2016 during days of fighting in the capital Juba that forced Machar to flee for his life. Speaking prior to the agreement's signing, David Shearer, head of the UN Mission in South Sudan, sounded a note of caution. His fears were echoed by Britain's Chris Trott, who spoke for the Troika bloc that also includes Norway and the United States and provides key funding to the peace process. "We remain concerned about the parties' level of commitment to this agreement," he said, citing recent fighting in the northwestern city of Wau and the deaths of 13 aid workers in South Sudan this year alone. The US last week said that 107 aid workers and 13 journalists had been killed since the war began. "The Troika is committed to peace in South Sudan. But in order to be convinced of the parties' committment, we will need to see a significant change in their approach," Trott said. After decades of civil war, South Sudan voted to leave its northern neighbour Sudan in 2011, becoming the world's youngest country. International frustration with the warring parties peaked in July, when the UN Security Council slapped an arms embargo and sanctions on two military officials to encourage South Sudan's leaders to turn away from the battleground and seek a diplomatic solution. Efforts to revive the failed IGAD peace talks began in earnest in June this year with a face-to-face meeting between Kiir and Machar in the Sudanese capital Khartoum that led to the signing of a fresh ceasefire. The peace deal comes as once-feuding governments in the wider, volatile Horn of Africa region move to settle long-held grudges. In July, Eritrea and Ethiopia ended a two-decade-long border dispute, normalising relations and paving the way for Eritrea's expected return to IGAD. Ninety-six hours after ASP Muhammad Kirumira was shot dead in Kampala, a senior colleague yesterday expressed a deep sense of fear that he could be next to fall to an assassin’s bullet. Assistant Commissioner of Police Siraje Bakaleke told The Observer that he could turn up as the next victim off an alleged kill list of high-profile targets. He, however, did not say who could be after him. “Since I started challenging my case at the Anti-Corruption court, I started receiving threatening messages on my phone and these messages through WhatsApp and SMS have persisted after the death of Kirumira,” Bakaleke said by telephone last evening. These threats to his life are recorded at CPS Kampala under reference GF 075/20/2018, the officer said. “I have decided to keep at my residence. I know it is because of my hard work that I am haunted; I have served my country diligently; I have sacrificed my family because I don’t sleep while solving people’s problem only to be paid with malicious uncompleted charges just to pull me down,” Bakaleke said. 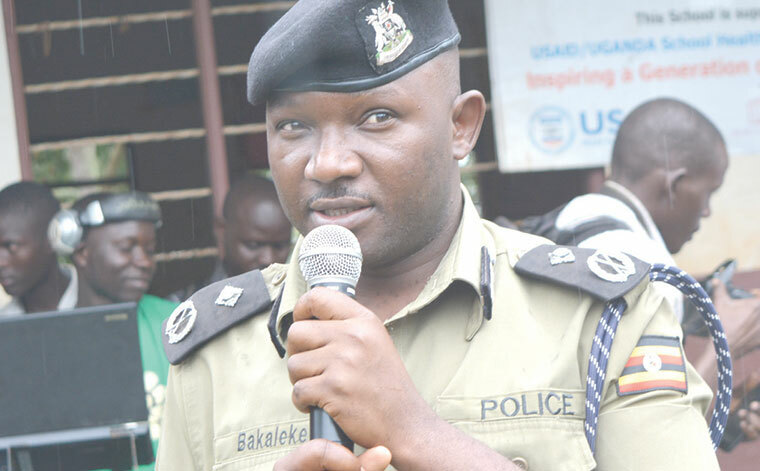 Bakaleke is currently out of office, having been suspended from his influential posting as regional police commander for Kampala South on April 17 after being charged with the unlawful arrest of three South Korean nationals from whom he allegedly grabbed Shs 1.4 billion. His interdiction came around the time several top police officers were being picked up in a wave of arrests by military intelligence and the Internal Security Organisation. The arrested police officers were detained amidst suspicion of engaging in espionage, and a crackdown on suspected collusion between criminal gangs and high- level police personnel reportedly said to be close to former police chief, Gen Kale Kayihura. They remain in military custody and face, among others, charges of abduction and forced return of Rwandan nationals reportedly fleeing political persecution back home. Some are undergoing trial before the Army General Court Martial. Before he fell in a hail of bullets fired by two hit men who used high-powered motorbikes to get away last Saturday night, Kirumira had appealed a demotion in rank resulting from a police disciplinary court ruling. Agitating for a massive clean-up, Kirumira’s troubles in the force are believed to have been aggravated by his loud criticism of Kayihura’s policing methods and management style. He had also become very outspoken, denouncing what he referred to as rogue elements in the senior hierarchy of the police whom he said were deliberately fuelling the rising crime in the country. The last time Bakaleke was seen in public was on Sunday when he attended the Kirumira send-off prayers at Gaddafi mosque. Inside the mosque, he stood up and declared to fellow mourners that he too was on the list of those to be killed. He did not attend High court yesterday where his petition against trial in the Anti-Corruption court came up before Judge Musa Ssekaana. His lawyer, Robert Senfuka, also did not attend but after court adjourned, the lawyer told journalists that his client had called and said he would not come to court because he feared for his life. “He told me his life has been in danger since he started challenging the case before him. He started receiving threatening sms and WhatsApp messages on his phone,” Senfuka said. Deputy police spokesman Patrick Onyango last evening said that as a senior police officer, Bakaleke knows the procedure to follow when one’s life is threatened. “The first thing is to report to the nearest police station and then go to his bosses and brief them about that alleged threat, and also ask for security which is guaranteed at his rank,” Onyango said. “This is better than going to the press”. In March 2017, AIGP Andrew Felix Kaweesi died when twin hitmen, also riding on motorcycles, ambushed his convoy and pumped several rounds into his body. Kaweesi, a Kirumira mentor and close friend, died together with his bodyguard Kenneth Erau and driver Godfrey Mambewa. During the Tuesday interview with The Observer, Bakaleke said that save for a service pistol he still carries, the police force has not taken extra measures to secure him since he reported his fears. Bakaleke’s co-accused in the Korean affair include city lawyer Paul Wanyoto, Samuel Nabeeta Mulowooza, D/ASP Innocent Munerezo, D/ASP innocent Nuwagaba, D/AIP Robert Ray Asiimwe, PC Junior Amanya, PC Gastavas Babu and Kenneth Zirintusa. Musisi says that over the years, between Shs 700 and 900 million was spent on organizing the festival, whose income was been used to fund the rehabilitation of KCCA schools.